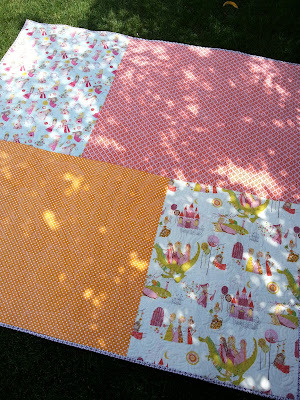 Happiness is a quilt finish on a Wednesday morning. Following in the madness that was the #scrappytripalong I made this quilt for my 6 year old daughter. She has grown out of her baby quilt so this will be her big kid quilt. With the fabrics that I originally pulled I needed to add a bunch more from my stash to add depth and contrast. The purple was an after thought, but I love it! Totally makes the quilt in my opinion, especially the darker pieces. 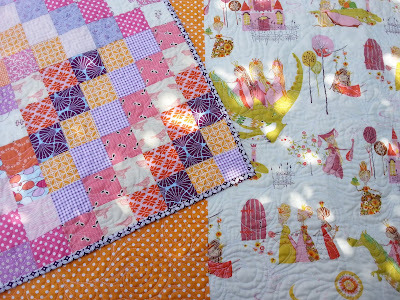 Can you see the dragonfly in the quilting? My quilter, Lynn, did a beautiful job. She also quilted my daughter's name and a bunch of flowers into the quilt. You can imagine that my 6 year old loves all of it! For the back I was trying to use up some stash. I had two princess prints from Alexander Henry's Once Upon a Time line that my daughter was in love with. 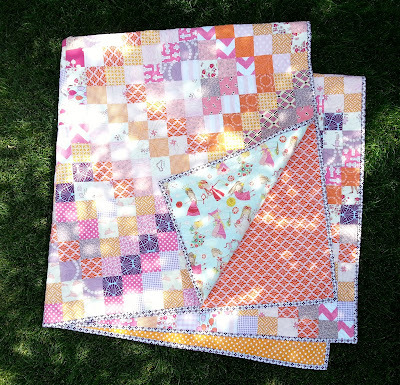 I paired them with an orange polka dot from JoAnn's and a piece by Jennifer Paganelli for Free Spirit. I'm sure I got the Free Spirit piece on a clearance at my LQS. I've had it for a long while. I just kind of color-blocked them together. The binding is also a JoAnn's piece I had in my stash. Again, it was not part of the original plan, but came about after the quilt was done. 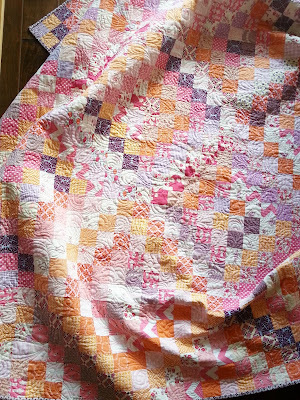 I like that it highlights some of the fabrics in the quilt rather than blending in. I love this quilt, my daughter loves this quilt. Win-Win! Previous posts about this quilt can be found here, here, and here. It is beautiful, and I agree. The purple makes it. Hm. Maybe I should finish my scrappy trip . 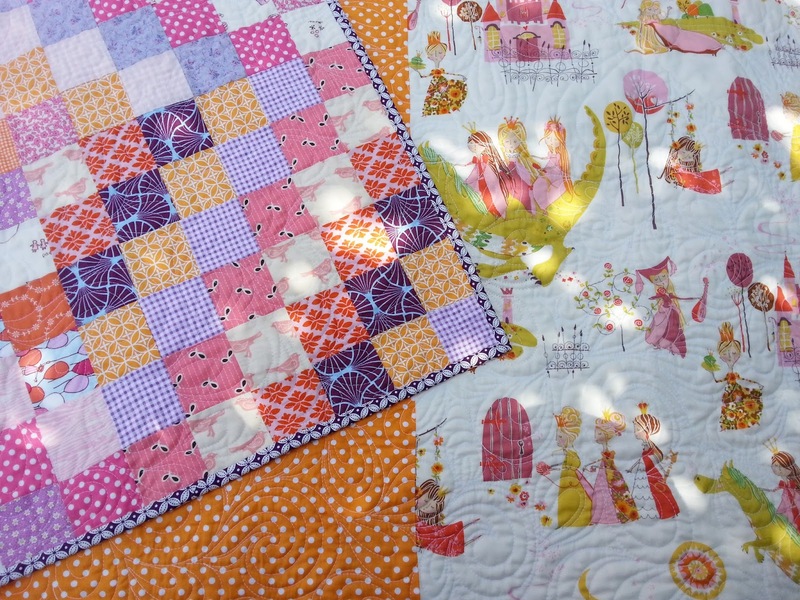 . .
this quilt is so beautiful, and you're right- that darker purple adds so much depth to the quilt! 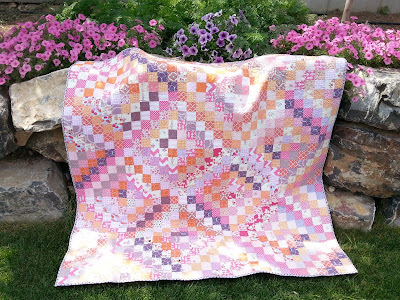 That pic of the quilt with the petunias is just gorgeous, by the way! very nice, I am sure your daughter will love it for years to come. I agree about the darker purple by the way, the perfect additive. yours is gorgeous!! i love the coordinated scrappy trips. mine is not . . . but maybe someday i'll make a coordinated one. i really like them!! 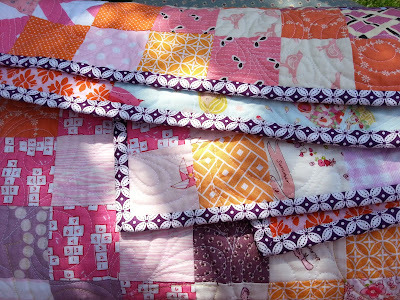 Great quilt and good use of what you have on hand - love it! I am a new follower via BL. A beautiful quilt! Love the color combination. The binding gives it that extra pop! Gorgeous. Love the colours and LOVE the backing fabric.